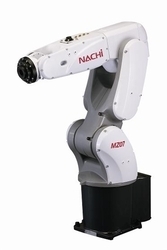 Our range of products include articulated robot. The world's fastest speed specification contributes to improved productivity. Improves practicality by reducing the risk of interference between the wiring and nearby equipment, and enables easy entry into confined areas. In addition to the standard specification, visual, additional axis and force sensor specifications are available, satisfying all needs at a production worksite.